It’s that time of year, when the competition is fierce to see, as the New York Times calls it, “the World Series of competitive frog jumping”: the Calaveras County Fair and Jumping Frog Jubilee. 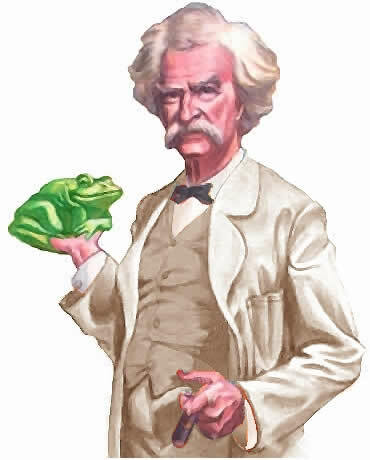 Based on the famous Mark Twain short story, The Notorious Jumping Frog of Calaveras County , this annual event started in 1928. Bad weather and squabbles have affected the stability of the event, but, as AP reports, about 4,000 contestants competed today. Still, no one has beaten the 1986 record of 21 feet, 5 3/4 inches set by Rosie the Ribeter. So anticipation mounts for next year’s event!